Wesley Hottot and Tony Mauro take a look at the unanimous Supreme Court ruling in Timbs v. Indiana, discuss the case, the path to the Supreme Court, and the impact on future cases. Back in 2013, Tyson Timbs’ $40,000 Land Rover was seized by police after he was arrested and charged with selling $400 worth of heroin. After Timbs and his attorney filed suit, his case went from Indiana state court all the way to the Supreme Court of the United States. In a unanimous Supreme Court ruling in Timbs v. Indiana, this ruling now requires cities and states, not just the Federal Government, to abide by the Eighth Amendment’s Excessive Fines Clause, preventing law enforcement from imposing excessive fines in seizure cases, setting up a historical precedent. On Lawyer 2 Lawyer, host Craig Williams is joined by Wesley Hottot, senior attorney for the Institute for Justice and Tony Mauro, Supreme Court correspondent for The National Law Journal and Law.com, as they take a look at the unanimous Supreme Court ruling in Timbs v. Indiana, discuss the case, the path to the Supreme Court, and the impact on future cases. Wesley Hottot: I think that for there to be a real improvement in property rights in this country we need lawmakers to get in the game and end civil forfeiture. Tony Mauro: This really wasn’t important and historic decision and in one of those cases that make me very happy and proud that I cover the Supreme Court. 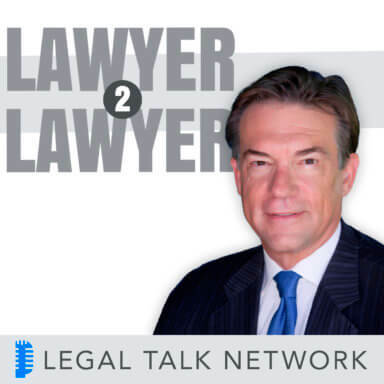 J. Craig Williams: Welcome to Lawyer 2 Lawyer on the Legal Talk Network. I am Craig Williams coming to you from sunny, Southern California. I write a legal blog called ‘May It Please the Court’ and have two books out called ‘How to Get Sued’ and ‘The Sled’. Before we introduce today’s topic we would like to thank our sponsor Clio. Back in 2013 Tyson Timbs’ $42,000 Land Rover was seized by the police after he was arrested and charged with selling only $400 worth of heroin. After Timbs and his attorneys filed suit, his case went from the Indiana State Court all the way to the Supreme Court of the United States. In an unanimous Supreme Court ruling called Timbs v. Indiana, now requires cities and states not just the Federal Government to abide by the Eighth Amendment’s excessive fines clause preventing law enforcement from imposing excessive fines and seizure cases setting up a historical precedent. So today on Lawyer to Lawyer we’re going to take a look at the Supreme Court ruling in Timbs v. Indiana. We will discuss the case, the ruling, and the impact on future cases, and to do that we’ve got a great lineup of guests today. Here to discuss today’s topic is Wesley Hottot, a senior attorney for the Institute of Justice. He won the landmark case of Timbs v. Indiana in the Supreme Court that established that the State and local authorities must comply with the excessive fines clause of the Eighth Amendment on the attempt to forfeit property. Welcome to the show, Wesley. Wesley Hottot: Thanks for having me. J. Craig Williams: And our next guest is Tony Mauro, the Supreme Court correspondent for the National Law Journal in law.com. Tony has covered the Supreme Court for 39 years, first for Gannett News Service and USA TODAY and then since the turn of the century for the Legal Times, the National Law Journal and now Supreme Court Brief, a subscription newsletter about the court. Welcome back to the show, Tony. Tony Mauro: Thanks, good to be with you. J. Craig Williams: Well, Wesley, it seems only right since you were the attorney that you straighten out my little shorthand introduction of the case and kind of give us a background of what happened and give us a little bit of guidance about what happened in your case today? Wesley Hottot: Well, you’re right that in 2013 when Tyson Timbs was caught up in a drug deal involving undercover officers that in addition to quite righteously prosecuting him for selling a small amount of heroin the police also seized his $42,000 Land Rover which at the time was practically brand-new. Indiana unique among all 50 states allows private attorneys working on contingency to then represent the State and civil forfeiture actions. These of course are actions against property not people, but they’re connected to crimes and the prosecutor in this case attempted to take the vehicle, the trial judge in rural Grant County Indiana said you can’t do that, that violates the Eighth Amendment’s excessive fines clause. The intermediate Court of Appeals in Indiana agreed and then the Indiana Supreme Court held that the Eighth Amendment’s excessive fines clause does not apply in State or local proceedings because the US Supreme Court had never clearly held that it does. We took over the case at that point to petition for cert. We got cert last June, argued the case last November and then on February 20th we got a unanimous ruling from the US Supreme Court, saying, no, that’s incorrect, the Eighth Amendment’s excessive fines clause does apply in State and local proceedings. So, we’ve now been remanded back to the Indiana Supreme Court. J. Craig Williams: Tony, is this — how do we look at this case? I mean, throughout the Appellate Court, the local court, it was only the Indiana Supreme Court that couldn’t understand that the Bill of Rights applies to the states, was it a provincial ruling or what was their basis for doing that? Tony Mauro: Well, I think it’s a very important ruling, not just related to Indiana in the sense that as you know that not all of the parts of the Bill of Rights have been incorporated or applied to the states and local governments and this was one of the clauses of the Bill of Rights that had not been applied or it had been applied in many states but the Supreme Court hadn’t really finalized and adopted that view. So this was a case where the Supreme Court fixed that problem. I recall during the oral argument, which Wesley will of course recall, Justice Gorsuch said, here we are in 2018, still litigating incorporation of the Bill of Rights really? He said, come on General, he was talking to the Indiana Solicitor General who was arguing against incorporation of the ban on excessive fines. So, anyway, I think it’s quite a historic decision. I think in my 39 years I can’t recall another case, well, there probably has been one or two, but we are a part of the federal Bill of Rights, expanded its scope to State and local governments as well. J. Craig Williams: Wesley, there was a lot of discussion about Policing for Profit, what was the argument in that area? Wesley Hottot: Well, as many of your listeners may know civil forfeiture is a kind of legal fiction that allows the government to proceed against property and civil court when that property is alleged to have some connection to a crime. Now the procedure used to be a kind of personal jurisdiction tool that the United States and other countries would exercise against pirate ships or rum runners for things like customs violations, when you couldn’t get personal jurisdiction over the individual ship owner. But beginning about in the mid 80s with the explosion and the war on drugs this tool has been turned on every day Americans, some of them are convicted of crimes, some of them aren’t even charged with crimes, this procedure has really exploded because there’s a profit incentive built into it at the federal level in almost every State the police and prosecutors who seize property get to keep 100% of the proceeds of the property that they see. So it’s become a kind of self-funding mechanism and particularly in a time of shrinking budgets and lawmakers not wanting to ever increase taxes, increasingly you have law enforcement kind of living off the land out there. And although, Tyson was guilty of a crime, he pled guilty and did everything that was asked of him to try to reintegrate into society, he suffered the secondary punishment of civil forfeiture, and I’ve had clients at the Institute for justice who did absolutely nothing wrong and found themselves caught up in this process. And of course because it’s civil you’re not entitled to a lawyer, you’re not entitled to a speedy trial and it may take months or even years before you have an opportunity to go before a judge and argue that your property was wrongfully taken. So when we talk about policing for profit what we’re talking about is, is this explosion in civil forfeiture where lawmakers have built an incentive into the system for police and prosecutors to take property from people. J. Craig Williams: How does the situation happen when the police recover property, say on a boat that’s on its way into the beach but there’s nobody aboard the boat and they pursue the property and go after it, what happens in those situations when an owner later comes forward, isn’t that essentially saying that’s my property and I’ve committed the crime? Is there any kind of protection for that? Wesley Hottot: Yes, there are Admiralty procedures that we still use today for civil forfeiture actions even those on land. There are abandoned property procedures that make this easy when the government finds a car that no one claims or a ship that’s just adrift on the high seas, but under something called the Civil Asset Forfeiture Reform Act of 2000, at the federal level the innocent owners enjoy an opportunity to come in and object to a forfeiture action. Now, again, because this is not a criminal proceeding the burden is on that person to prove their own innocence by a preponderance of the evidence and for many people that means that they’ve got a higher attorney, they’ve got to go through the difficult process of litigation and for that to be worth it, the property has got to be extremely valuable, many of these seizures and forfeitures involve small dollar amounts currency less than $5,000 or if you even take Tyson’s case involving a $42,000 vehicle, I mean, if he didn’t have pro bono attorneys it would make no economic sense. To pursue recovery of that vehicle I assure you we spent many times over that in attorney time alone. I’m taking this case to the Supreme Court. I mean, he’s fortunate that he is represented by the pro bono attorneys at the Institute for Justice but many people don’t contest forfeitures because it’s simply not worth it. J. Craig Williams: Tony, there were some unusual strategies employed here, can you tell us about those? Tony Mauro: Well, this was kind of a signature strategy of the Institute for Justice which kind of invented the notion of surrounding a Supreme Court case with a public campaign, rallying the public to take a side in this litigation. At first, Institute of Justice who just first started this 10-15 years ago, it was seen as kind of unseemly that the court — you shouldn’t be lobbying the court in that sense and it’s really not lobbying but it’s just — it’s sort of creating some momentum. They did that with the Kelo case involving eminent domain, they started, had a campaign against eminent domain abuse, and a whole nation kind of involved in this case and to great success. And again, in this case, the excessive fines case that we’re talking about, the Institute for Justice had started a kind of a campaign about that issue that the police were improperly confiscating the property of people who hadn’t really necessarily done anything wrong and I think that gave momentum to the case as it went to the Supreme Court, and I think it was extremely successful. It’s just — it’s something that not everybody does but the Institute for Justice does it really well. J. Craig Williams: Tell us about that Wesley. Wesley Hottot: Well, Institute for Justice has been around for 25 years now, and Tony is right that we litigate our cases in court and in the court of public opinion. And unseemly or not, I mean, it’s a strategy that increasingly has been adopted by private lawyers that are trying to get cases granted by the High Court and for good reason. We need the public to be more educated about what goes on in the legal system particularly about issues like civil forfeiture which frankly people don’t know about even people that are educated in the law. People don’t know about really until it happens to them or it happens to one of their clients. I mean I face incredulity all the time when I tell people that your property can be taken from you without you even being charged with a crime let alone convicted of one. I think it’s essential that the public know about this practice and other obscure legal practices and that judges know that the public cares about these things because they’re — for better or worse, there tends to be a kind of silo effect between the judiciary and prosecutors. Many members of the judiciary the predominantly being former prosecutors and it’s not going to be until the general public and lawmakers really shine a light on these issues that we start to see movement, even in areas that the judiciary controls entirely like constitutional rights. J. Craig Williams: Well, gentlemen, thank you very much. But before we move on to our next segment, we’re going to take a quick break to hear a message from our sponsor. We’ll be right back. Bob Ambrogi: Imagine what you could do with an extra 8 hours per week. That’s how much time legal professionals save with Clio, the world’s leading practice management software. With intuitive time-tracking, billing and matter management, Clio streamlines everything you do to run your practice, from intake to invoice. Try Clio for free and get a 10% discount for your first six months when you sign up at their website clio.com, that’s clio.com with the code L2L10. J. Craig Williams: And welcome back to Lawyer 2 Lawyer. I’m Craig Williams. We are joined by Wesley Hottot, Senior Attorney for the Institute for Justice and Tony Mauro, Supreme Court correspondent for the National Law Journal and Law.com. We’ve been talking about the Supreme Court ruling in Timbs v. Indiana regarding civil forfeiture. Tony, there’s been an argument presented in this case that there may be a difference between a fine and a forfeiture or some issue about whether a fine includes a forfeiture, what is the background behind that? Tony Mauro: Well, to be honest, I’m not quite sure of that. I don’t recall that from the briefs I read, but I probably missed something, so I might defer to Wesley on that point. Wesley Hottot: Well, I’m happy to address it. Indiana faced an uphill battle in making the argument that the excessive fines clause isn’t incorporated. Tony referred to Justice Gorsuch’s kind of disbelief that they were even arguing that. And I know the Solicitor General for Indiana, Tom Fisher, he’s a good lawyer, and so, given a dog of a case, they made the best of it that they could and so what they tried to argue was that while the excessive fines clause may apply in State and local proceedings, the excessive fines clause should not apply to forfeitures. Now, this was a difficult argument to make because in 1993, the US Supreme Court in a case called Austin v. United States had held that federal forfeiture actions are fines within the meaning of the clause. And so, Indiana was forced to argue that while that might be true of federal forfeitures it should be true of state forfeitures. They should be kind of a Constitution-free zone. It’s gratifying that the Court recognized incorporation of the clause but it was also gratifying that they rejected that argument effectively saying, well, not effectively, they literally say in the majority opinion, we’re not going to revisit Austin. Tony Mauro: And just to add to that, just as a reminder. As you mentioned earlier, the Land Rover would cost about $42,000 that was confiscated and the maximum fine that Timbs would have gotten as a fine for a crime would have been $10,000. So it’s hard to conceive the $42,000 confiscation is not being a fine. So I think the court took care of that issue. J. Craig Williams: Is there still a question, Tony, in the Supreme Court’s mind that the Bill of Rights may — not all of the Bill of Rights may apply to the states? Tony Mauro: There are a few lingering clauses that have not yet been incorporated. Yes, as you have mentioned, the justices seem kind of impatient about that. It’s time to get that over with and get everything that’s in the Bill of Rights to apply to State governments. So I think there will be cases coming along. The court can’t just reach out and make that decision. They have to have a case before them that poses that issue. And there’s a case coming up I believe about whether non-unanimous jury trials are acceptable or whether the right to have a unanimous jury verdict can be incorporated into State and local government as well. And there are a handful of other provisions of the Bill of Rights that could still be incorporated. Wesley Hottot: Yeah, that’s right. Tony is absolutely right that that question of whether the Sixth Amendment right to have an unanimous jury verdict against you if you’re going to be convicted of a crime is up next term in a case called Ramos v. Louisiana or again is the only remaining State that allows a jury of 12 people to convict you by 10 votes for conviction even if there are two votes for acquittal. Louisiana had that practice until last November’s election when the voters passed the constitutional amendment to change it but the gentleman in the Ramos case was convicted under the old rule. So we’ll find out before the end of next term whether that right is incorporated against the states. J. Craig Williams: Is this ruling retroactive? I mean, there have been an awful lot of forfeitures that we’ve read about? Can people now go back to the government and say, hey, give me my money, my things back? Wesley Hottot: I think not. I mean, in general of course the law disfavors retroactive decisions. The situation here is conceptually this right was incorporated in 1868 when the Fourteenth Amendment was passed and as Tony mentioned earlier that the vast majority of states have recognized that the excessive fines clause applies to them. Indiana was one of just four states that had questioned that. And so, that being the sort of conceptual framework that the court understands incorporation under it was incumbent on lid against to raise the excessive defines defense in the past. And if they didn’t do that or didn’t press it to the full extent then the law can be a real harsh mistress about those kinds of failures. J. Craig Williams: Tony, Justice Thomas issued an opinion, a concurring opinion in this case that frankly, I’m kind of at a loss to understand why, but can you tell us about his concurrence? Tony Mauro: Yes, Justice Thomas in many ways likes to upset the applecart and tries to plant seeds for future cases and had the court look at long-standing doctrines differently. And in this case, he objected to the fact that the incorporation of the Bill of Rights is justified through the due process clause of the Fourteenth Amendment and that’s been accepted for a very, very long time. But Justice Thomas says excessive fines and many other provisions of the Bill of Rights have nothing to do with process or due process. So he would rather have this incorporation process take place through the privileges or immunities clause, and he and a number of scholars think that that’s the more legitimate way of incorporating parts of the Bill of Rights to the states. It’s controversial because the Supreme Court a long time ago kind of narrowly interpreted the privileges and immunities clause and nobody has really touched it ever since. But that’s the kind of thing that Justice Thomas likes to stir up as a sort of a thought challenged for future cases and future justices. Well, he may have a friend now in Justice Gorsuch who in doing his own concurrent said, Justice Thomas may be right about the texturally and historically correct basis for incorporation being the privileges or immunities clause, but it doesn’t really matter in this case because this right Justice Gorsuch said is so clearly incorporated under the due process clause as well. J. Craig Williams: Wesley, how did Tyson Timbs react to this and obviously he’s the only who have been remanded so does he have his vehicle back yet, has he got more litigation in front of him to get it back? Wesley Hottot: He does have more litigation in front of him. Our first move after getting the win was to ask the State of Indiana just to return the vehicle. I mean this is a 2012 Land Rover that’s been sitting exposed to the elements on a lot for nearly six years. It’s practically worthless, but the State would like to continue to litigate over it to — they say try to establish what the correct standard for judging excessiveness is, and if they want to dance we can dance. You asked about Tyson’s reaction, I mean, he was overjoyed. If you ask him he would say I wrote off this vehicle a long time ago, I want it back, but that’s not really the issue for him. I’ve heard him say time and again in interviews that the issue for him is one of principle. He thinks that people who commit crimes are not hopeless that they need to be given a realistic opportunity to rehabilitate themselves and reintegrate into society, and that taking away their vehicles, their cash, even their homes this makes all of that more difficult. I mean, Tyson has a litany of obligations to the government which he faithfully tries to fulfill including going to substance abuse counseling. He has been doing volunteer work on behalf of other opioid addicts, and he’s got to hold down a job. All of those things become really difficult if not impossible in a place like rural Indiana if you don’t have a car. J. Craig Williams: Well, Wesley and Tony, it’s time for us to wrap up and get your final thoughts as well as your contact information. Tony, I’d like to throw it over to you first, can you give us a little bit of a conclusion wrap up for this along with your contact information? Tony Mauro: Well, just to reiterate that this really was an important and historic decision and in one of those cases that make me very happy and proud that I cover the Supreme Court because of those, that kind of a case that goes back, as Justice Ginsburg put it, the excessive fines clause has a history going back to the Magna Carta and so now there’s a new development in that long history. And as far as where I can be found online, I’m at the National Law Journal, it’s www.law.com/nationallawjournal, and you will find my stories there most of the time. J. Craig Williams: Great, thank you very much, Tony. And Wesley, I would like to turn it over to you next, and I am kind of interested to find out what’s on your radar? What is the Institute for Justice’s next big campaign? Wesley Hottot: Well, we’re continuing our initiative to end civil forfeiture, because while a case like this is an important benchmark, all it does is put a protection — a judicial protection in at the end of the civil forfeiture process, where a judge can say, look, based on all the circumstances I think that this particular forfeiture is excessive, but nothing about our argument prevents the government from seeking serious fines for serious crimes, or for continuing in fact, to take people’s property without even charging them with a crime. And so for the long term what we need is for lawmakers to get in the game here and as lawmakers have done in states like New Mexico, North Carolina and California recently abolished civil forfeiture. No American should lose their property without being convicted of a crime. There’s no real need for this procedure to be turned on every day Americans, if you will, common criminals, as opposed to pirate ships and things like that. And I think that for there to be a real improvement in property rights in this country, we need lawmakers to get in the game and end civil forfeiture. And if folks want to reach me, our website is www.ij.org. You can find my contact information there. We also have a website for our civil forfeiture initiative called endforfeiture.com. J. Craig Williams: Great. Thank you very much. We would like to thank both of our guests today for being on the show talking about the Timbs v. Indiana ruling. Wesley Hottot, the Senior Attorney for the Institute for Justice, and Tony Mauro, Supreme Court Correspondent for the National Law Journal and law.com. Well, that brings us to the end of our program. If you liked what you heard today, please rate us in Apple Podcasts. You can also visit us at legaltalknetwork.com, where you can leave a comment on today’s show and sign up for our newsletter. I am Craig Williams. Thanks for listening. Join us next time for another great legal topic.